James White scored for Phantoms in MK. Peterborough Phantoms took over at the top of NIHL Division One South last night (December 8). he city side eased to a 5-3 success at troubled Milton Keynes Thunder – a club desperately attempting to raise money to secure their future – to climb to the summit. Glen Billing scored for Phantoms against MK. In the process they leapfrogged title rivals Swindon, who crashed to a surprise 5-2 home defeat at the hands of Raiders, to go a point clear whilst also boasting two games in hand. Phantoms now host the Wildcats at Planet Ice tonight (December 9) in a mouth-watering clash. 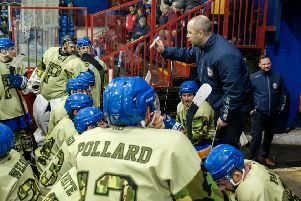 Head coach Slava Koulikov said: “We’re playing some great hockey and we’re enjoying an excellent run of results. “We always take one game at a time and that approach has helped us to get into good positions in all competitions. “I’ve said many times that we are again over-achieving this season. Of course we are very happy to be top as it is not a position we expected to be in, but things can change very quickly. Phantoms trailed in Milton Keynes last night at the end of an opening period in which they had more than double the number of on-target attempts as their hosts. The Thunder breakthrough actually arrived during a Phantoms’ powerplay and came complete with a slice of good fortune as a Ross Bowers’ effort deflected in off the stick of Tom Norton. Phantoms were frequently frustrated by the exploits of Thunder netminder Jordan Lawday in that opening session, but the highly-rated Welshman was powerless to prevent them from taking command in the second period. It was little more than a minute old when Glenn Billing levelled before two goals in quick succession enabled Phantoms to ease into the lead. James White struck with a short-handed effort before defenceman Scott Robson made a powerplay count, but the troubled hosts refused to roll over and twice cut Phantoms’ lead to a single goal during the final stanza. Hallden Barnes-Garner got the first of those Milton Keynes goals before the scoring was completed in a flurry of activity late on. Martins Susters and James Ferrara both found the net for Phantoms to sandwich an effort from Thunder import Trevor Leblanc. Koulikov added: “MK are in a tough situation off the ice and were also short-staffed on it, but they still gave us a tough night. Phantoms have a crucial few days ahead as the top-of-the-table showdown against Swindon tonight is followed by the second leg of the NIHL Autumn Cup final against Sheffield Steeldogs on Friday (December 14).